With the help of my family and people who have donated to Camden's Fundraiser, I was able to actually afford to get him a car seat and stroller! I want to thank everyone SO MUCH for helping me!! This car seat is deep enough for Camden where I wont have to worry about his bottom slipping out of the strap and him falling out. As you can see on the stroller, the bottom where a child's legs would come through, is closed. This is the safest car set/stroller travel system that I could find for Camden. Thanks to all of you, my baby boy will be very safe, and less worrying for momma! On August 14th, I had a regular checkup with Dr. Fong. 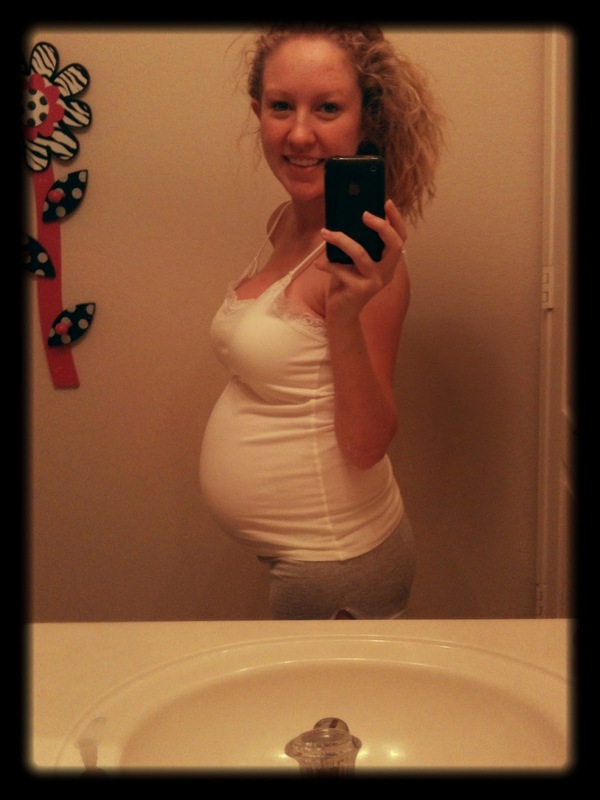 I was 31 weeks and 5 days pregnant. He measured my uterus and I was measuring at 25 weeks, 7 weeks behind. Camden's heart sounded beautiful, and I gained one pound. Dr. Fong told me that he wasn't sure how comfortable he was in delivering Camden vaginally, and that he is leaning more towards C-section just to be safe. I thought about it for a second and agreed with him. If Dr. Fong isn't comfortable delivering Camden vaginally, then that makes me uncomfortable. He said that he isn't comfortable because something could go wrong, like Camden's shoulders getting stuck and if he had to pull him out, then he could possibly damage the nerves in Camden's neck and shoulder and he would never be able to use that arm. I know there is a low chance of that happening, but I rather take the safest route possible. Camden's health and safety are my #1 concerns. So I will have a C-section when I am 39 weeks pregnant, which will most likely mean Camden will be here on or around October 4th! On August 15th, I had an ultrasound appointment with my Perinatologist, Dr. Brown-Elliot. They were running behind so I was taken for a tour of Labor & Delivery, and when I got back, they were still running behind, so they strapped me up to a machine where I can hear the baby's heartbeat and it monitors the baby's heart rate, movements, and if I have any contractions. I had a couple contractions while I was in the waiting room, but I have them all the time so I didn't think that they were anything to worry about. The nurse came back in and said that Dr. Fong was on the phone and Dr. Brown-Elliot told her to clean me up. After talking to Dr. Fong, Dr. Brown-Elliot said that she is sending me to Labor & Delivery and most likely stay over night and have my contractions monitored. I got to Labor & Delivery at around 5:30pm. The nursed checked me, said I was a fingertip, but not dilated, and that Camden's head is VERY low. (Makes since of why its been hurting so bad to walk around) The nurse strapped me up to monitor Camden's heart rate and my contractions. I was steadily having contractions every 1-2 minutes apart and Camden's heart rate was still dropping, but not under the 100s. My Mom got there around 7:30pm and I was still having contractions every 1-3 minutes apart. Around 8:20pm my contractions started to get really painful and at about that time Dr. Fong got there! He said that I wasn't in active labor, and that I am not dilated, so the nurse is going to give me a shot to stop the contractions and see how I am in an hour or so, and most likely send me home that night. The nurse came in and gave me the shot at about 8:40pm. That shot stung so bad and made me so shaky! They finally let me eat something at around 9:00pm. The contractions stopped, Camden was VERY active, and I was released around 11:30pm! I haven't had anymore contractions since then! I am so thankful that everything turned out okay with me and my baby boy! I don't know what I would have done if I had him this early. Thanks to everyone who was praying for me and Camden while I was in the hospital. Without your prayers things could have been a lot different. I also want to wish Camden a Happy 32 weeks!! That is 8 months for us!! Only 7 more weeks until I will have my baby boy in my arms! I'll share a belly photo I took this morning, even though I look very tired!